There's an interesting article posted in Korea's eDaily News, quoting an LGD senior official - saying that LGD plans to produce over 5 million OLED TVs in 2015 (in fact they hope to sell between 5 and 6 million). LGD makes around 50 to 60 million TV panels (mostly LCDs of course) - and they want OLED panels to account to around 10% of all TV panels shipped. LGD does not expect LG Electronics to sell all those OLED TVs - they are confident and Chinese makers (and perhaps Japanese makers as well) will help them sell that large number of panels. Both Skyworth and Changhong are already offering OLED TVs that use LGD OLED panels. And it is reported that both Sony and Panasonic are in talks with LGD for OLED panel supply. LG acknowledges that the main barrier to OLED TV adoption is the high price. While prices fell over 70% in the past year and a half, OLED TVs are still very expensive. But LGD is confident that once the new M2 line is on line, prices will be drop further as economics of scale kick in. This is obviously very ambitious. But will LGD be able to pull this off? LGD's upcoming Gen-8 M2 OLED production line will have a monthly capacity of 26,000 substrates - or about 150,000 55" panels. Assuming 100% yields (which is not achievable, obviously) - that's only 1.8 million panels in a year. Perhaps LG wants to make smaller TV panels? But even if LG makes only 32" panels (very unlikely), at 100% yield the M2 fab will only be able to make 5.3 million panels. Maybe the company is already actively planning a second line at that fab, extending the capacity further. To reach 5 million yearly panels, they will have to increase the M2 capacity three-fold at least - and this will cost at least $1.2 billion. While 5 million OLED panels will generate more than $5 billion in revenue for LGD, this is still risky when the first line isn't even finished yet.. Still it's great to see LGD being so aggressive on OLEDs. The company stated before they see the OLED TV market to pick up from 2014 and they expect OLEDs to gradually replace the LED TV market. 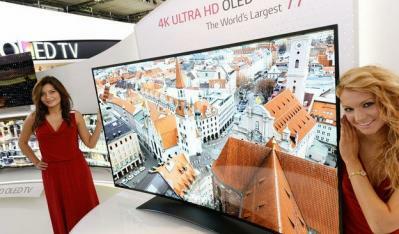 In fact, LG thinks that 2014 will mark the beginning of a "rapid shift" to new 4K and OLED technologies. Market research companies are more cautious. iSuppli for examples sees only 700,000 OLED TVs shipped in 2015 while DisplaySearch sees only about 500,000 curved OLED TVs shipping next year. If LGD will indeed be able to ship millions of OLED TVs, those market research companies will have to revise their estimates and numbers very quickly. And LGD does not plan to stop with flat and curved OLED TVs. The company is also actively developing technology (with support from the Korean Government) that will enable 60" transparent flexible UHD Panels by 2017. The company actually plans to release such a product by the end of 2017.